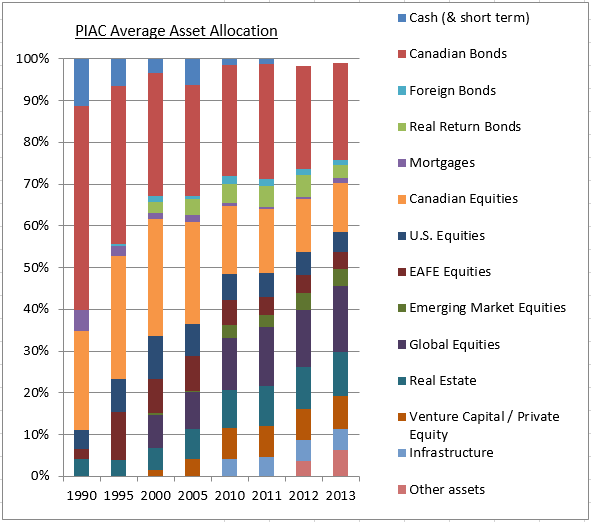 The PIAC Canadian pension plan composite average asset allocation for 2013 changed very little from previous years. One of the arguments this blog makes is that for individual investors who need a starting point to construct their own investment portfolio, the PIAC composite average asset allocation can be a useful benchmark. 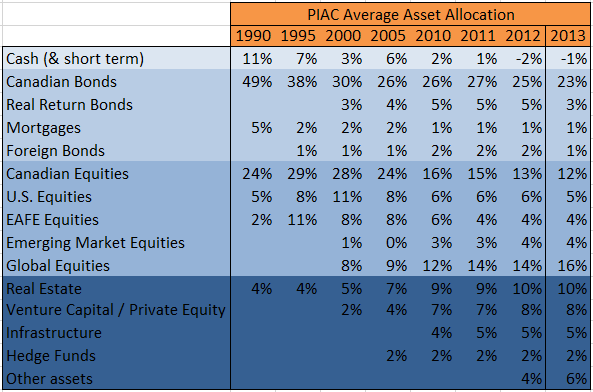 Blog readers who do use PIAC as a guide for their own personal pension portfolio will note that, once again, the PIAC average asset allocation changed very little in 2013 from previous years. A Towers Watson Global Pension study indicated that the average global asset allocation was 52% equities, 29% bonds. Not unlike the PIAC asset allocation averages. (This blog cites the study here). Pension & Investments charts show Global and U.S. pension plans (see Feb 3, 2014. Aggregate Asset Mixes) have similar asset allocations to PIAC. Again, note the (roughly) 1/3rd bond allocations. (This blog referred to charts here and here). Pensions & Investments indicates that the top 10 Canadian pension plans represent about 1/3rd of all Canadian pension assets. See here. (Also referred to in this blog here). Broad and global diversification The PIAC composite average asset allocation shows exposure across asset classes, regions and currencies (and very likely, sectors and styles as well). Broad, global exposure means some volatility offset and opportunity for returns from many corners. Further, asset allocation moves are measured steps (on average) rather than abrupt swaths. Investors ought to keep this in mind the next time they see a headline that shouts great rotation out of bonds, for example. Total bond allocation for 2013 was 29%. Recall that the average bond allocation has been roughly 1/3rd since 2000. Domestic bond allocation dropped to 23% from 25%. Relative outperformance of stocks rather than a reduced bond allocation may be a factor here. Clearly, bonds remain one of the best ways to match long-term pension liabilities. Foreign bond and real bond allocations both dropped. Pension plans may be saying why assume both interest rate and or currency risk? Even before markets corrected circa 2007 – 2009, but especially as stock markets are since recovering, pensions have been rebalancing out of stocks and into Alternatives thus maintaining the average stock allocation at a stable 41%. Clearly (see chart) over time the funding for Alternatives has come from Canadian Equities. This makes sense. Recall that the foreign content restrictions were relaxed. Until 1994, foreign content was capped at 10%. In 1995 it moved to 20%. 30% in 2001. And 100% in 2005. Since 2005, the Canadian stock allocation has dropped by ½ in attempt to diversify, enhance income and return and reduce volatility. Canadian stocks contribute disproportionately to pension portfolio volatility (or any portfolio volatility for that matter). Emerging markets allocation stayed at 4%. Some pension plans will have increased their actual EM exposure by relaxing constraints in their Global and EAFE mandates thereby allowing those managers to stretch in to the EM space. 10% to 15% per Global or EAFE mandate, say. Up at the plan level however, the aggregate EM allocation on a look-through basis is much larger than the designation 4% allocation. Relaxing constraints is an easy and inexpensive way to extend EM exposure. It’s a problem if it’s unintended and a cause for concern if the majority of performance is generated from EM and not from the actual Global or EAFE mandate. An Investment Committee might say, I’ll take additional exposure to faster growing EM’s while enjoying the downside protection of large cap EAFE multi-nationals. Individual investors, through an EAFE ETF, say, also have additional EM exposure as multi-nationals obtain significant sales from EM. Other assets grew to 6%. As pension plans reach for yield, they stretch into more exotic markets. According to CPP and OTPP, other assets can include mezzanine debt, asset-backed-securities, intellectual property, royalties, natural resources, repurchase agreements, absolute return strategies, tactical or foreign exchange strategies and derivatives. Just a thought for now, but the further the reach into exotics the less clear the overall risk profile and the more watered-down traditional risk tools become. Then again, the fruit is always far out on the branch. … but that’s for another blog-day. PAIC does not publish average plan returns, so we can use proxy. RBC Investor and Treasury Services Pooled Fund Survey for the period ended Dec 31, 2013 indicates the average balanced pooled fund in Canada delivered 15.8% to end 2013. Note how, with time, the returns approach longer-term averages. Individual investors who don’t have a strategy for their personal retirement investment portfolio might use the PIAC composite average asset allocation as a starting point. Simply mimic the PIAC allocations, replicate the risk characteristics and anticipate similar returns. Hi Doug. Really enjoy your blog and the simple (but powerful) rationale behind your approach. Just wondering if you have a sense of why the allocation to US equities is relatively small? And by “relatively”, I guess I mean not the 20-25% commonly recommended in “couch potato” or similar passive investing strategies. Are the pension plans concerned about some sort of valuation metric related to US equities (like Schiller’s PE) or is there some other reason? Appreciate your thoughts. Thanks. Comments like yours make it all worthwhile. Yours is a good question. Here’s is a couple of points. 1. The outright allocation to US equity = 5%. Plus about 1/2 of the allocation to Global equities makes the US allocation closer to 13%. (Last time I looked, the US allocation to global equities was 40% – 50% depending on the benchmark for Global ie MSCI ACWI or MSCI World). And, over time, the global allocation has roughly doubled while the direct US allocation has been flat to down. So in 2000, say, the US allocation (plus Global) was ~15%. In 2005, the US allocation (plus Global) was ~13%. The US allocation has bee a steady ~13% since 2000. 2. Given the strength of the US equities in 2013, pensions may be rebalancing out of US equities (as part of their de-risking strategy as the funding level increases). 3. The foreign content restrictions allowed only 30% as recent as 2001 and didn’t reach 100% until 2005. One would have thought the US allocation would have grown. It didn’t. It actually dropped. Recall there was that nasty tech wreck thingie that may have spooked skittish investment committee’s. Also recall, Canada’s market, during that period was on fire. 3. I think the major factor is that when consultants model a pensions asset mix, one of the major considerations is correlation. The Canadian market is highly correlated to the US market. You’ve heard it said that if the US sneezes, Canada gets a cold. From statcan.gc.ca 2011-02-11) ‘In 2009 73% of Canada’s exports went to the United States, and 63% of Canada’s imports were from the United States.’ It is very likely that such modelling has capped the US exposure somewhat. (Professor Marston at Wharton told me that Canada is the US’s small cap market segment. Jeez. Harsh but true). I’m not a big fan of the Global mandates for individual investors. While I get the rationale for global sectors, it seems to me that there is enough zig and zag across geographies and currencies that there are opportunities for the ‘global, macro, top-down, relative valuation’ type of investor. (ie. Me). Tougher to see an EM diverge from a US diverge from a Euro mandate but it does happen. Thanks. Yes, abundant sense. Though, you could say a little more about your next to last sentence? “Tough to see an EM diverge from a US diverge from a Euro mandate but it does happen.” I’m not quite clear on what you mean there. Thanks again. I am still relatively new to the investment game but have adopted much of your suggested approach to my own modest portfolio. Since then, all markets seem to be converging … I want to see some divergence. With zero interest rates and zero volatility … how does one capitalize on a correction if markets don’t correct? How does one buy low? It’s tough to do is my point. So we rely on having a plan in place and … patience. i READ WITH GREAT INTEREST YOUR LATEST INFO ON PIAC ASSET ALLOCATION, AND AGREE IT IS A GREAT BASIS FOR THE THE INDIVIDUAL INVESTOR TO FOLLOW. HOWEVER, HOW DOES THE AVERAGE RETAIL INVESTOR GET ACCESS TO “THE ALTERNATIVES” YOU HAVE OUTLINED? REAL ESTATE SHOULDN’T BE A PROBLEM THRO REIT,s, BUT VENTURE CAPITAL/PRIVATE EQUITY & HEDGE FUNDS IS ANOTHER MATTER? YOUR COMMENTS WOULD BE APPRECIATED. I don’t think it’s feasible for individual investors to try to access the more exotic beyond real estate (Private equity, Venture capital, Hedge funds etc). And, if we are still talking about the basics of asset allocation, diversification, fundamental risk, return, tax and cost issues … then do we really want to venture into ‘Alternatives’? Many institutional investors do a subpar job of due diligence and oversight regarding some Alternatives … how could the Individual investor be expected to do any better? The closest complement to a ‘core’ portfolio that I am comfortable with is the iShares.ca Multi-asset class ‘Alternatives Completion Portfolio Builder’ (XAL) that right now has some Corporates, Hi yield, Global real estate and a pinch of commodities. XAL is on my buy list. I just came across another way to access ‘alternatives’ (and I’m not sure why I didn’t think of it earlier). If you are registered / enrolled in some sort of DC pension plan, the (the provider Sunlife, Great West Life, Standard Life …) may provide an alternatives or pseudo-alternatives asset-class / investment manager. For example, Sunlife’s DC offering of investment managers includes ‘Lazard Global Listed Infrastructure fund’, ‘also a Bentall/Kennedy real estate fund’. Many thanks for your latest update. I guess I am one of the lucky ones with a DB pension plan so I have no control over which investments are used. However, your comments and suggestions were much appreciated.